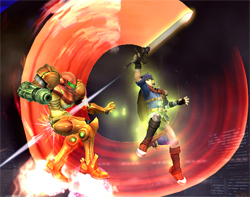 Ike's strategies revolve around Eruption and his Aether, as well as some grabbing. Normally Ike is a hit-and-runner, due to his slow speed. But when the opponent's damage is high, then that's where being as Ike is fun. As the point of brawl is to KO people, you have to attack people. Naturally people will come near you, and that's where you can use your Eruption to your side. This attack grows when charged, and will also rise people up. When they are up in the air, you can wait for them, and grab them. You can repeat by throwing them up, and attacking with your Aether attack, to rack up a good 25% damage. Another thing to do after you use Eruption is to use a Quick Draw attack, or when you feel like enough, to hit them with a smash attack to gain a point. With the possibilities of three follow-ups, this will leave your opponent thinking, and that's the time to make them lose a stock. Many of Ike's strategies revolve around Quick Draw. Try to stay away from your opponents but close enough that you can unleash Quick Draw at any time. When your opponent's damage is in KO range, the fun begins; instead of attacking with quick draw, every now and then cancel the attack and use a smash attack. Because a cancelled Quick Draw has very little recovery time, you can throw in any type of attack, and this confuses your opponents as to whether you're going to use Quick draw or cancel it. But that's not all! if you're charging Quick Draw, your opponent may try to attack, so cancel it and use a counter instead! For a character with medium-slow attacks, you usually have the advantage in almost all your situations, and this makes you rule the field in a 1-on-1 match (during a free for all it's not quite so simple, but it still works). Because of this strategy, Ike can out-do almost all his opponents if they're heavier than him, and it works against many medium characters too. On smaller, faster characters however, it's not quite the same. Ike Combo Punches, knees then swings his sword. Most damaging jab in the game. + + + + Power Slash Swings his sword outwards. + + + + Sword Bash Jumps, hitting with his sword. + + + + Low Swing Swings his sword while crouching. Slow, but a good meteor smash. while dashing while dashing while dashing while dashing Dashing Swing Swings his sword forward while sliding a little. Smash + + + (Smash + ) or (Smash + ) or Sword Swing After a short delay, he swings his sword powerfully forward. Also hits above to an extent. It has the higest knockback scaling out of any forward smash in the game. It is the second most powerful foward smash in the game. Smash + + + (Smash + ) or (Smash + ) or Upward Swing He swings his sword in an arc over his head. This is most powerful when the enemy is above him, but also works for enemies in front and behind. Smash + + + (Smash + ) or (Smash + ) or Front Back Slash He swings his sword low to the ground on both sides. This is his fastest smash attack. However, it's his worse move overall as its knockback is weak and leaves him vulnerable if it misses. after grab after grab after grab after grab HeadButt Ike headbutts the opponent. after grab after grab after grab after grab Forward Kick Ike kicks his opponent forwards. after grab after grab after grab after grab Rear Kick Kicks opponents backwards. after grab after grab after grab after grab Uppercut Ike uppercuts his opponent. after grab after grab after grab after grab Ike Stomp Stomps on his opponents. Ragnell Circle Ike swings his sword in a circle. One of his fastest moves. + + + + Critical Swing Swings his sword downwards in front of him. + + + + Rear Swing Ike swings his sword outwards behind him. + + + + Ragnell Copter Ike swings his sword above him. + + + + Ragnell Blow Forcefully stabs below him. It is the second strongest meteor smash in the game. Eruption The longer this fire attack is charged by holding down the right button, the more powerful it becomes but when this move is fully charged you will receive 10% recoil damage. 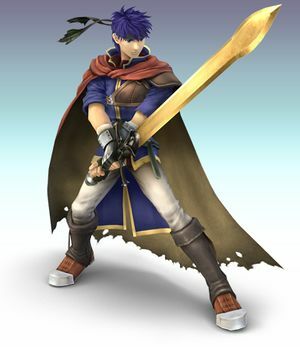 + + + + Quick Draw Ike dashes forward, swinging his sword at whoever he runs into. Also a charged move. This can be hard to master; think of it as a chargeable version of the Star Fox team's sideways special moves. + + + + Aether Ike tosses his sword into the air, leaps up, and plummets downward. He doesn't flinch while tossing his sword into the air. + + + + Counter If an enemy attacks Ike while this move is active, the attacker receives 120% damage depending on the attack Countered. Ex. 20 Damage Becomes 24 Damage. This move is slower to start than Marth's, so you must use this through prediction, not on reaction. He holds out his sword in front of him and grunts as his cape blows in the wind. + ( or )+ or or He holds his sword to his side and says "Prepare yourself!" + He thrusts his sword into the ground and goes "Hmph," as his cape blows in the wind. Great Aether: Ike throws the enemy to the skies with a slash and says "Great aether!!" then starts hitting and slicing the enemy savagely (similar to Link's final smash but can trap up to three opponents) and finishes with an eruption attack in the air. This page was last edited on 12 February 2015, at 14:44. This page has been accessed 72,832 times.